Jane is on the show today all the way from Russia to discuss how productizing her own skillset helped her build her business and reach out to the kinds of clients she truly loves working with. What exactly is productized consulting? Productized consulting means creating a standardized menu or package of what you do and how much you charge for it. These packages easily refer clients to your expertise in a way that answers all of their questions without making more work for you. It makes you an easy and approachable hire for your clients. It answers a lot of their questions, and it puts you in the seat of the one who has control. Ideally, you want to create packages that streamline your most popular and successful services. Jane recommends advertising a package for the work you do most for your clients so you can start building a brand. From there, you can then offer a range of packages to attract a wider range of clients. A variety of products will speak to different clients with different budgets. For example, Jane offers a consultation call at the low end of her budget to attract those new clients that may not be ready for a full UI audit. Using productized consulting puts you in control of the work that you do. You are at liberty to define the scope and process of your projects. You create the expectations and the deadlines. These packages lay it all out for your potential clients so they can decide for themselves if they want to work with you, and you can focus on doing what you love and deliver high-quality work. Deliver real results for your clients. The trick with productized consulting is figuring out which packages work for your particular business. You don’t have to be a web designer or a programmer to offer brilliant consultancy packages. Productizing works for writers, drop-shippers, even mentors, and coaches. It’s up to you to define what kind of audience you want to serve and then niche down to offer specific types of services to your particular client. By productizing your services, you are outlining the best way of working together. If you want to deliver real results for your clients, then niche down the work that you really love to do. Remember, you aren’t going to want to create packages for work you absolutely dread doing. You work for yourself so you can do the kind of work you love, right? Jane says you can easily connect with the work that makes you happy by looking back and picking out your top two favorite clients. Take a look at the work you did with them and ask yourself what made it so fun and successful. What made those perfect clients so easy to work with? How can you replicate that relationship? The answer to these questions will help you niche down and deliver the kind of work your clients are looking for. Don’t be shy with your rates. The biggest worry freelancers have with productized consulting is the price. Charging too much can alienate potential clients, but charging too little can make you look incompetent. Jane recommends finding a happy medium and then charging just a little bit more. Always charge a decent rate because it is super beneficial for both parties. It increases trust levels, you get listened to much better, and you can also accommodate for that additional overhead to delight the client with the quality of your work. The point of productizing your skills is to help you move away from what Jane calls “the evil ways of billing”. The hourly rates most freelancers are used to puts the price on your time instead of on the quality of your work. With productized consulting, you will want to move toward value-based pricing. Consider more than just time. Think about the energy, the emotion, and the quality of work you are creating for your clients rather than how many hours it takes you to complete it. Charging a premium price for the work you do won’t turn clients away from you. In fact, it will do the opposite. Charging a little bit more shows that you are serious about what you do and guarantees that you will deliver high-quality work. Think about it – having a bigger budget up front gives you the room you need to create and cover unexpected costs so you can really blow them away with the final product. Promote your services with a killer sales page. One of the most important topics that are discussed today is related to creating a sales page. When it comes to productized consulting, your sales page is your bread and butter, especially if you’re worried about your rates. The sales page is your opportunity to promote your brand, show off your skills, and justify your fees. The first and most important step to writing a killer sales page is knowing your audience. If you’ve asked yourself about your favorite clients and niched down your skills to re-create that winning relationship with every sale, then you’re already on your way. Focus on a specific service and sharpen it for a specific audience. It allows you to write a very laser-focused sales page that will resonate with them. The second step is being as focused as possible when you write. You don’t want to be vague when it comes to writing a sales page. Vague means boring. You want to be focused. You should hone in on what part of your expertise can bring the most value to your client and then explain how you can bring that value to the table. To do that, Jane says you need to study up on the client’s area of business. You want to be able to talk to them in their language, with their terms, to show off what you know what about their business and how your particular skill can help them succeed. This fixed section on your sales page where you explain how your skills work for your client is where you make or break your product. You want to be as clear and concise as possible. Describe in detail how you’re going to meet your client’s expectations and solve their problem. Create an outline so your clients know the step-by-step process that comes along with working with you. Give them a clear play-by-play so they know upfront how hands-on you’re going to be and how much time they have to invest with you. In the pain section you are calling out client problems, in the dream section you describe how their life would be if someone solved their problem, and then you describe your solution, which is a fix. The best part of productized consulting means you don’t have to keep creating new proposals or packages. Once you’ve packaged your skills and written your sales page, you may update it once or twice throughout the year, but otherwise, you’re set. You can continue to attract new clients with your sales pages while existing clients return for what Jane calls “daily services”, which she charges separate rates for. If you really want to build your brand and break free from the hourly rates that hold you back, this is a great way to do that. 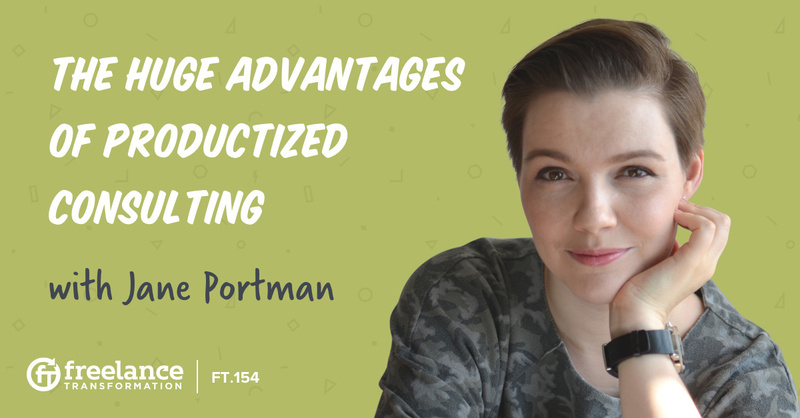 Jane Portman's productized consulting tips have helped numerous freelancers establish themselves as successful entrepreneurs and we were very fortunate to have her on the show for the second time! Purchase Jane's new book Your Productized Consulting Guide. And use the promotional code FREELANCETRANSFORMATION20 to receive 20% off!